My friend Allyson, made these and posted on Insta the other day and I had to share with you all. I love tex-mex food so much, that my heart literally skipped a beat when I saw her photo. These look so deliciously epic. I can't wait to make them for our next tailgate. I love simple recipes that you can assemble before and cook on gameday. *Allyson added black beans and corn, which I think is a great idea. Directions: Preheat oven to 400 degrees. Brown and drain meat. Stir tomatoes, seasoning, 1/2 C cheese, and salsa into meat. 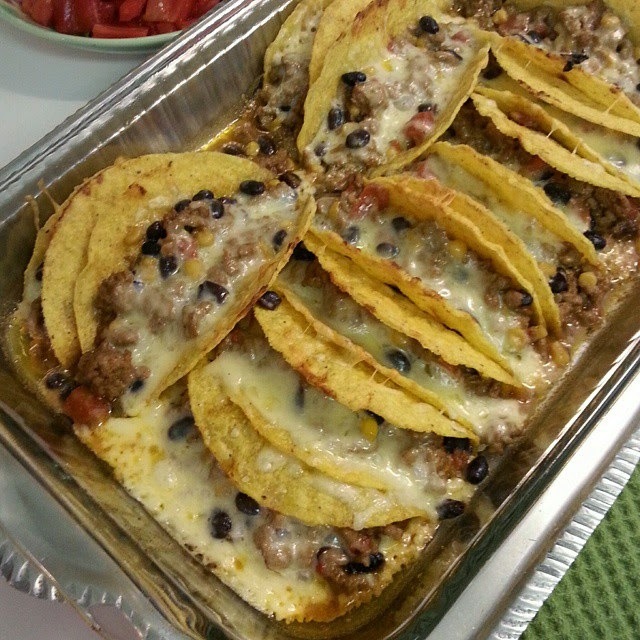 Arrange taco shells standing up in a 9x13" pan. Fill each shell with the meat mixture, dividing equally until all the meat is used. Sprinkle remaining 1/2 C of cheese over the tops of the filled tacos and bake for 15-20 minutes. Cheese will be melted and the meat hot. Top with shredded lettuce, tomatoes, cilantro, sour cream, guacamole and lime juice.